Yesterday we took a food tour with Tastebud Tours. This is a walking tour lasting about three hours, and you get to sample several sandwiches, pralines, beignets, gumbo, jambalaya and more as you walk through the French Quarter. The tour is also educational as our tour guide, Linda, explained how the foods are made and where they originated. She also stopped us along the way to point out additional bars and restaurants. The tour was a lot of fun, and we were absolutely stuffed when we were done. This was my first guided food tour, and I loved it! I definitely recommend Tastebud Tours (they are also located in other cities, so check out their web site for more tours). The tour started at Serio's Po-Boys & Deli in New Orleans' Warehouse District, just off Canal Street and the French Quarter. It's also right on the St. Charles streetcar line so this is a very easy place to get to. It's a big place, with lots of LSU signs and photos, making this a friendly sports restaurant. We were served a quarter slice of a muffuletta sandwich. 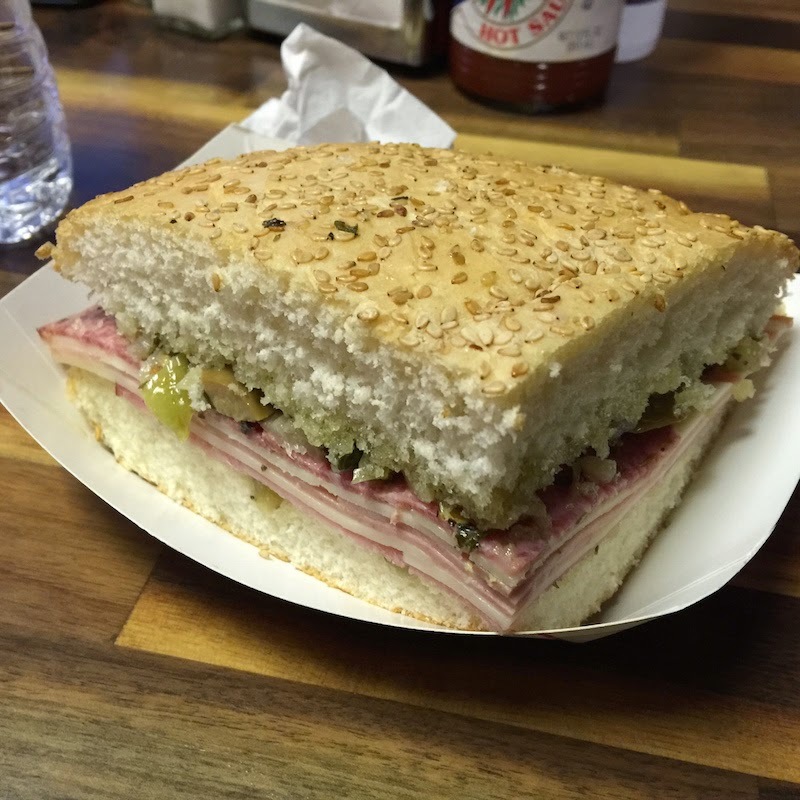 What's a muffuletta, you ask? 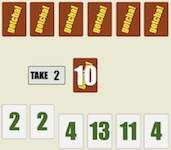 Here's the full deal on Wikipedia, but here's a recap: It's made on a whole loaf of muffuletta bread, which is round and somewhat flat, with sesame seeds. Instead of mayonnaise, there is an olive relish. I don't like olives, but this relish isn't bad and works for this sandwich. Some people in the group scraped it off, but I like to try new food exactly as it was intended, especially if I am on a food tour. The idea for the muffuletta bread is that it soaks up the oil in the olive relish. The meat on a muffuletta is ham, salami, and mortadella. Then slices of provolone and mozzarella cheese are added. So this ends up being like a sub sandwich on heavier bread. I liked it a lot. Like I said, the olive relish works with this combination of meat and cheese, and the bread really holds up so your sandwich stays together to the very end. 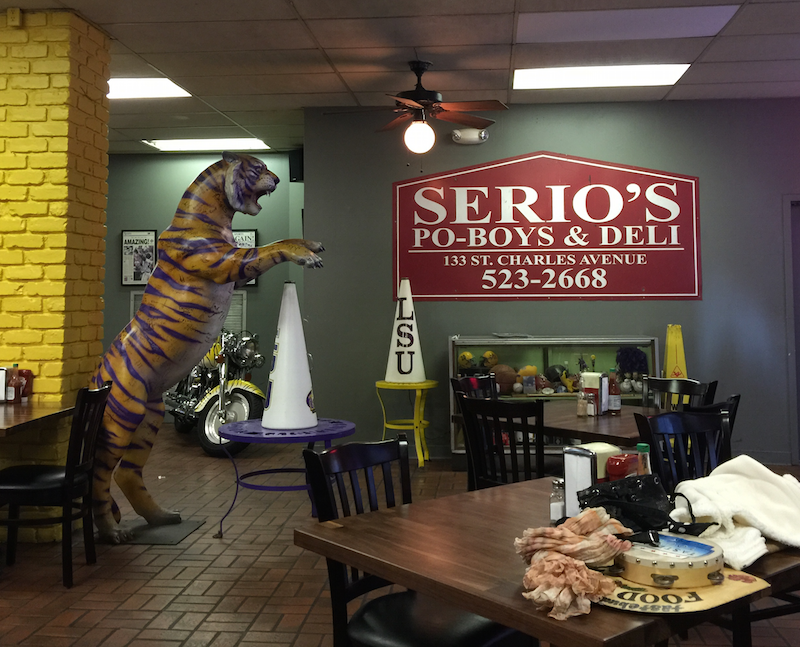 Serio's Po-Boys & Deli was seen on Throwdown with Bobby Flay on Food Network.